Dimensions: Wood Fired: 15.7" x 12.2" x 2.4"; Multi-Fueled: 16.1" x 9.8" x 2.4"
Weight: Wood Fired: 0.88 lb. ; Multi-Fueled: 1.5 lbs. I bought this for my husband…Its fabulous! we are having a blast cooking . Easy to assemble. Great pizza! I'm not sure what to think about this cover ... What to do when it's portable, to carry the detached chimney and not let it get scratched. 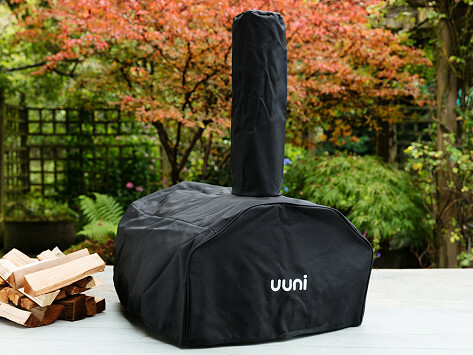 Chimney stack on the cover only thing I could figure out is to pull it wrong side in and lay in the bottom of the carrier then add the oven to the bag. No instructions and still a loose chimney to contend with. Possibly you could have a detached chimney sleeve and then reattach chimney while being a cover with grommet flaps to keep the elements out. Only useful for 1/2 intended purposes.